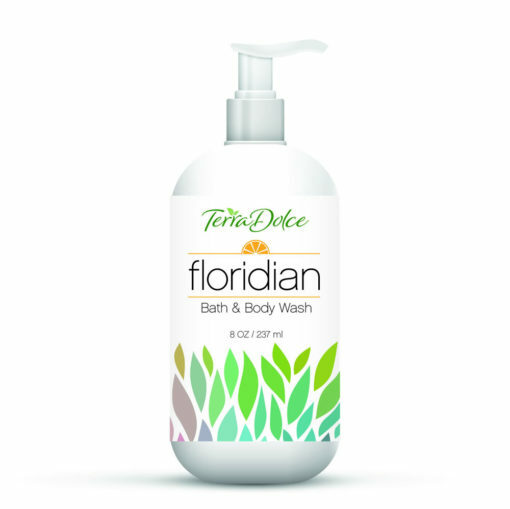 Purify and pamper your skin with Terra Dolce’s Floridian Bath & Body wash, an infusion of fresh botanical extracts, pro-vitamin B5 and silk amino acids. 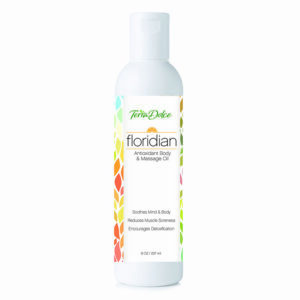 Luxurious suds lather without sulfates. Ideal for shower and bath. Suitable for shaving. Use on all skin types. 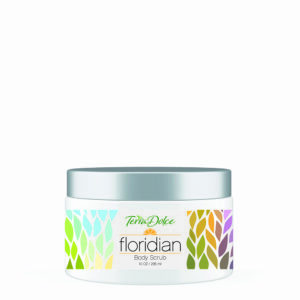 No parabens, phthalates, petrolatum, mineral oil, propylene glycol, retinol, sulfates, synthetic color. 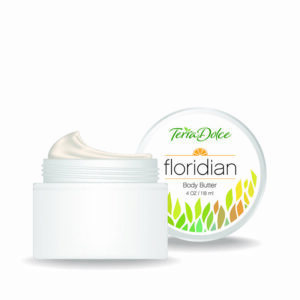 Light weight hydrating moisturizer packed with extracts and essential oils. 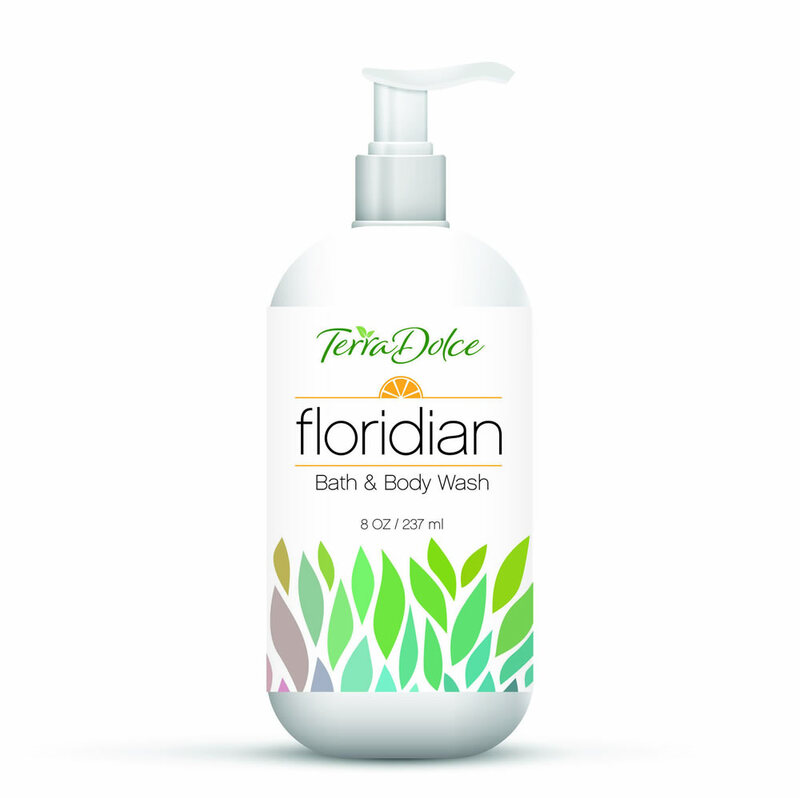 Leaves skin feeling softing and smelling like an orchard of oranges. For bathing, apply one or two pumps onto a pouf and massage over your entire body from the neck down. Rinse off leaving a fresh clean scent with skin hydrated. For shaving, massage a thin layer over the area to be shaved. Shave as normal. Rinse clean. Aqua (Purified Water), Sodium C14-16 Olefin Sulfonate, Cocamidopropyl Betaine, Sodium Chloride, Fragrance Blend of Essential Oil, Glycerol Stearate (and) PEG-100 Stearate, Citric Acid, Tetrasodium EDTA, Citrus Sinensis (Orange Oil from Florida), Methylchloroisothiazolinone (and) Methylisothiazolinone, Botanical Extract Calendula Officinalis (Calendula) & Matricaria Recutita (Chamomile) Flower Extract, Salix Alba (White Willow) Bark Extract, Pollen Extract, Aloe Barbadensis Leaf, Tocopheryl Acetate (Vitamin E).